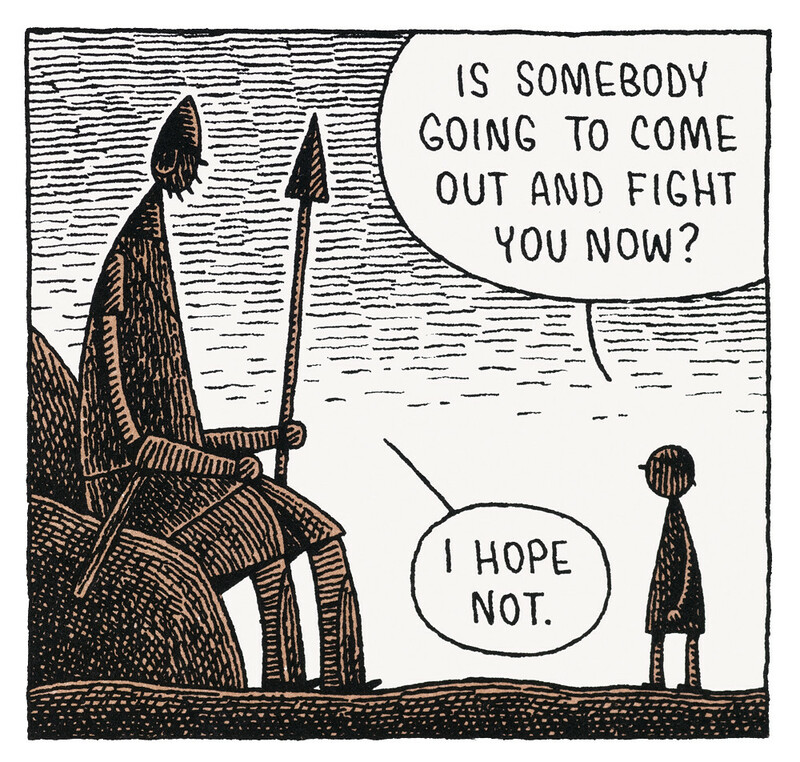 Tom Gauld’s Goliath tells the story of David and Goliath from the latter’s point of view. 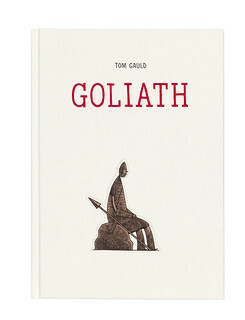 In this version, Goliath of Gath is a gentle giant, a mediocre swordsman who loves paperwork. Nevertheless, he is selected as champion of the Philistines, and duly heads into the valley of Elah to issue his challenge to the Israelites: to choose a man to fight him to the death in single combat to decide the outcome of the war. As most of us already know, this doesn’t end well for Goliath. But by the time David slings his fatal stone we have come to love this alternative hero, whom Gauld portrays as a loner: contemplative but brave, and kind to his nine-year-old shield bearer. Much of the emotional resonance of the story is shown through tiny details of facial expression, hand gestures and body language, such as Goliath’s stooped shoulders in contrast to the expressive eyebrows of the unbearably perky Captain – an ambitious ‘company man’. Gauld depicts the barren, silent landscape, littered with rocks and stones, in his customary cross-hatched brown and black. The sparse terrain dividing the warring armies hints at unknown threats behind the boulders, echoing the bleak modern battlegrounds of Iraq and Afghanistan. The empty nightscapes, with their waxing and waning moon and pinprick stars, speak of the loneliness of the isolated giant, while the depiction of the weather, changing from sun, cloud, lightning and mist suggests the passing of time over the 40 days and nights of the challenge. The inclusion of contemporary idioms, such as the Captain’s triumphant ‘Yes!’ combined with a raised fist, are so anachronistic that they invite laughter (as does the in-joke of a raven on Goliath’s writing desk). Yet it is the pathos of its sad end that gives Goliath its punch. Gauld emphasises the violence of David’s deadly throw with a full page image of the stone heading directly out of the page towards us. The reality of Goliath’s death is a shock.